Don’t you hate when your professor assigns group projects and at the moment you’re looking around the class to see who looks like a slack off and who doesn’t. Yes, I know you know what I’m talking about. For some odd reason I always get stuck in the bad group category. I guess I need help with spotting out productive people. I am usually the captain of the team and quarterbacking everyone else but I would have to say this year has been very good year for me. But at the same time if it wasn’t for the slackers I wouldn’t be the great quarterback that I am. It’s good to have the experience of putting people in the position that they can excel in or just setting out the goals for the group. So I thank all the slackers in the world who have made me a better person and leader. All the productive people take it as an overall positive, plus you can always go to the professor and say, “hey that kid had nothing to do with the project.” If you are the odd man out tell the people up front, “I’m don’t like this class and I don’t think I’m going to be very active and contribute to the group as you would like but I’ll do the best at what I can do.” Something like that, or just request to be in a different group, a group that shares the same quality as you. That will save a lot of time for a lot of people. 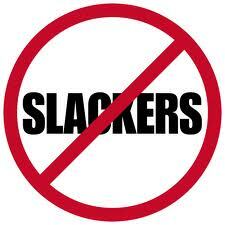 But anyways slackers are going to slack and leaders are going to lead, just know what category you’re in. Travell, I, too, am a leader and have been in the “bad group category.” I’ve always gotten frustrated and stressed out over group situations. You changed my mind with this post though. Being the leader of a bad group IS a positive because it allows us to grow and learn how to lead better. Great advice. Thanks for the post. yeah you got to try and look at the good in every situation. It only makes you better and separates you from the rest. Glad I can change minds and thank you for the comment.